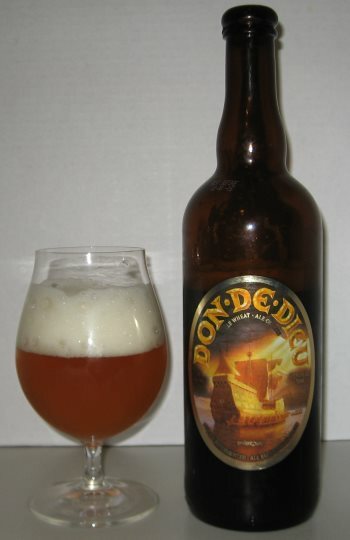 Don de Dieu is a trippel wheat ale from the Belgian masters at Unibroue in Quebec. There isn’t much of a head to this beer. You get a lot of foam early, but it disappears rapidly. 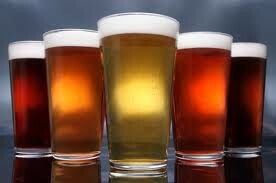 The nose is mild, which is pretty standard for a wheat ale, and it has notes of apricots, pears, and orange. The middle is tangy with mandarin, honey, pears, yeast, and a hint of alcohol. The finish adds pear syrup and vanilla to the mix. This is a medium to heavy bodied beer, and relatively high alcohol at 9% ABV. With the signature Belgian fruit and yeast, this is a lot more flavorful than a traditional wheat ale, so it will probably be a bit much for a Blue Moon fan, but it’s right up the alley for those who like big traditional Belgian styles. This entry was posted in Reviews and tagged Belgian, Belgian Strong Pale Ale, Canada, Pale Ale, Quebec, Unibroue, Wheat Ale on July 26, 2013 by Xander.